Having launched across seemingly every platform under the sun – PC, Xbox One and mobile devices – Coffee Stain Studios’ wholly bonkers, yet brilliant Goat Simulator will make the jump to PlayStation 4 and PlayStation 4 on August 11. Announced via PlayStation Blog, the studio confirmed that the port was built using only “the bleeting edge of technology,” and that the PlayStation version of the hyper-kinetic platformer will support two-player local co-op on PS3, and four-player local co-op on PlayStation 4. Because wrapping your tongue around the town’s water tower is better with friends, right? Promising more “goaty goodness” than you can shake your DualShock controller at, Goat Simulator on PlayStation will also herald the arrival of GoatVR. We’ve been working on GoatVR for some time, and we’re pleased to debut it in the PlayStation editions of Goat Simulator. GoatVR is the most authentic “simulated GoatVR experience” that doesn’t require a helmet or anything. Although it’s not quite ready yet we felt it better to stay ahead of the crowd and let it out into the wild. No word yet on whether the port will include Cross-Buy, though we’ll likely learn more about Double Eleven’s port in the lead up to release. 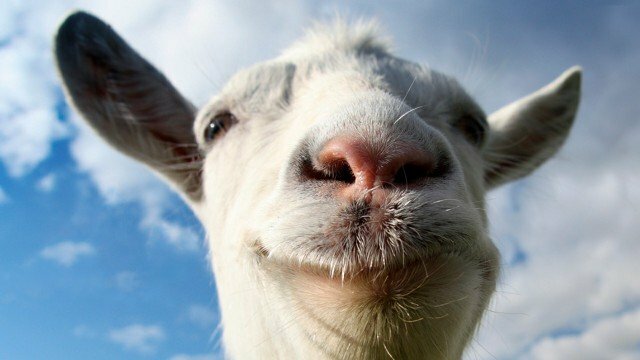 Goat Simulator will ram PlayStation platforms on August 11.